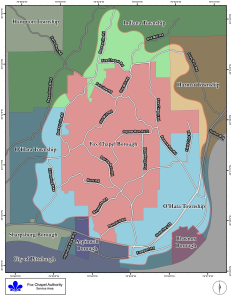 The Fox Chapel Authority currently serves an area of approximately 15 square miles with 5,500 customers or a population of approximately 18,500 people. We provide water service to all of Fox Chapel Borough, approximately two thirds of O’Hara Township, and 15% each of Harmar and Indiana Townships. We also provide bulk water sales to Blawnox Borough and parts of Aspinwall Borough. Our water is purchased from Pittsburgh Water and Sewer Authority (PWSA). The PWSA treatment plant is located on Freeport Road directly across the Waterworks Shopping Center and draws water from the Allegheny River.